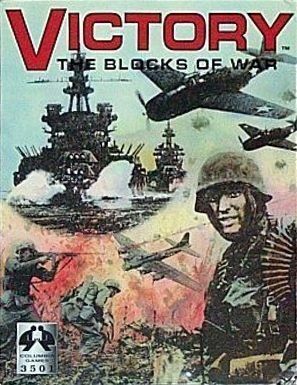 Victory: The Blocks of War is a Block game published in 1998 by Columbia Games. It is a generic war game played on modular maps with World War II units. The game uses a stripped down Front system, with the whole command control element removed and simplified movement and unit production. Block sets for blue and red players and several maps are included in the base game. There are many supplements available, including basic block sets for four additional colors (black, orange, green, and gray), ten-unit elite sets for each color, maps with various terrain, and a logistics expansion which provides a twist on production and adds other strategic elements to the game. Expanded by: Victory: The Blocks of War â Additional Blocksets Victory: The Blocks of War â Elite Blocksets Victory: The Blocks of War â Extra Maps Victory: The Blocks of War â Logistics Set Victory FAQ based on info in the rules forum here and elsewhere.